Welcome guest blogger Ali, who in the spirit of Beauties and the Feast gave cooking with artichokes a try for the first time! After hearing about the ‘Beauties and the Feast’ from Em and Missy, and in particular the ingredient of the month challenge, I felt the urge to get involved. No, I am not a good cook. In fact, I am a terrible cook. I have no idea what goes wrong – I follow recipes but somehow things usually turn out bad – at least more than 60% of the time. My husband is the cook in our household – which is great, but we are about to have baby #2 and I will be home all day for the next 3 months (with no excuse not to cook the evening meal – I’ve been warned), and it would be nice for him to come home to a NICE meal. So, I need to become a better cook, I like to experiment with new recipes and now have a great excuse to do so. So, I’m a guest blogger this month. Preheat oven to 350°F. Melt butter in large skillet over medium-high heat. 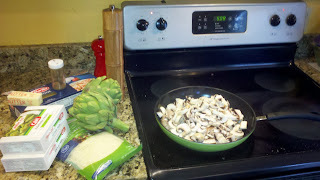 Add mushrooms and garlic; sauté until mushrooms release juices and begin to brown, about 7 minutes. Add artichokes and ½ cup water. Cook until liquid is absorbed, stirring occasionally, about 10 minutes. Season with salt and pepper. Melt butter in heavy medium saucepan over medium-high heat. Add flour; stir 1 minute. Gradually whisk in milk. 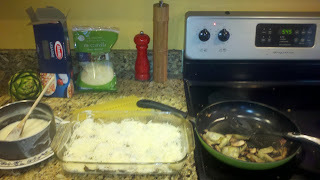 Reduce heat to medium and simmer until sauce thickens and lightly coats spoon, stirring occasionally, about 20 minutes. Stir in 1 1/2 cups Parmesan. Season to taste with salt, pepper, and ground nutmeg. 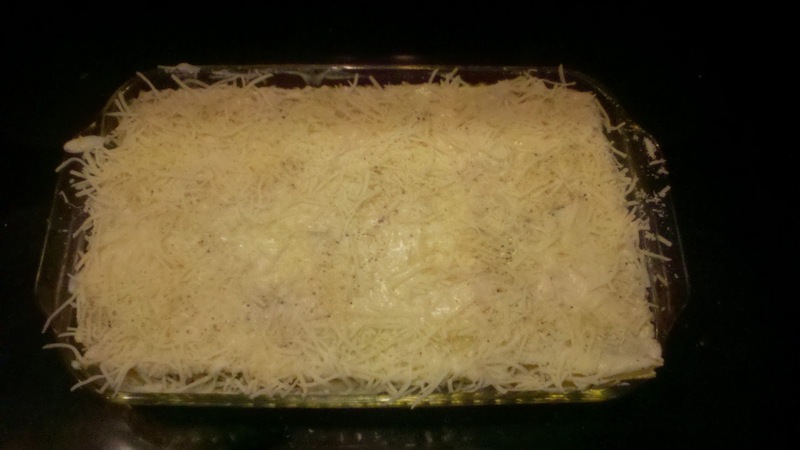 Spread 2/3 cup béchamel sauce over bottom of 13x9x2-inch glass baking dish. Top with enough noodles to cover bottom of dish. Spread 1/4 of artichoke mixture over. Spoon 2/3 cup béchamel sauce over. Top béchamel with 1/4 of mozzarella. Sprinkle with 3 tablespoons Parmesan. Top with enough noodles to cover. Repeat layering 3 more times, finishing with a layer of noodles, then remaining béchamel. Sprinkle with remaining Parmesan. 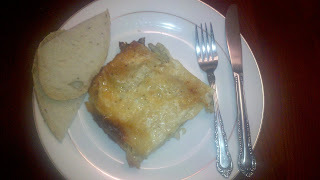 Bake lasagna covered with foil 1 hour (or 1 hour 15 minutes if chilled). Remove foil. Increase temperature to 450°F. Bake lasagna until golden on top, about 10 minutes longer. It came out of the oven looking tough and dry, and did not taste any better than it looked. In fact, it tasted bloody awful. The pasta was dry and chewy and there was nowhere near enough sauce or filling. I was rather disappointed but not surprised. Had I read the reviews first, I would have known that the recipe needed double the filling. And in this way, perhaps the dish would be better, but I am not convinced. Do not try this at home folks. Any advice from the Beauties on what I may be doing wrong with my source/choice of recipe would be very welcome. Wow, I am so impressed that with a 1-year-old and a new baby on the way any day now that you pulled off trying a new ingredient and a brand new recipe! It really does look delicious, I’m really sorry it was a bust. Always a huge disappointment when you pay for all the ingredients and take the time and then it’s not fabulous. What did Dylan think? Was he willing to try it? Dylan did not try it - he doesn;t like mushrooms and it was way too tough and chewy that we thought he might choke! Ali, thanks for bravely taking on the challenge! This one is tough for me because I'm already not a big fan of mushrooms but I also think anything that is sauced enough can't be that bad. So more sauce next time! It's funny I was thinking everything I stuffed in the eggplants would probably make for a really good lasagna filling too. An option or next time, if there is one. ;) Can't wait to meet baby #2 soon!! How can I make this go viral?